GG Commands is a free JSFL commands extension package, it makes jobs easier in Flash. After you download and install the GG Commands v2, you can access it from Commands menu. After you download and install the GG Commands v2, you can access it from Commands menu (screenshot). – Distributes selected text fields and symbol instances to keyframes. – Duplicate selected elements with specified quantity, scale, and rotation. – Insert multiple frames, keyframes, blank keyframes, or layers. – Resize selected text field to user defined width and height. – Scale selected shape/instance to the stage size, or with margin. – Slice selected bitmap instance to rows and columns. 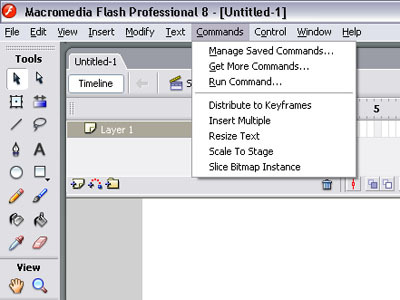 Warning: Slice Bitmap Instance command still has a unstablity problem causing the Flash IDE to quit or not responding. Please remember to save your document before slice. GG Commands is a free JSFL commands extension package, it makes jobs easier in Flash. After you download and install the GG Commands v1, you can access it from Commands menu. After you download and install the GG Commands v1, you can access it from Commands menu. There is a newer version of GG Commands available. Click here for more detail.